Here in Boulder County Colorado, we are fortunate to have an organization called PACE – Partners for a Clean Environment. PACE began back in 1993 as a partnership of local governments and businesses “committed to creating a business community with environmentally sustainable practices.” Today, PACE provides free expert-advisory services, financial incentives, and a certification program to help businesses measure and gain recognition for their sustainable environmental achievements. Over the years, Management and Engineering Services has worked, in conjunction with PACE, to identify and implement environmentally friendly improvements to our business processes and facilities. Now, as 2018 draws to a close, we are very pleased to announce that PACE has formally recognized Management and Engineering Services for our “commitment to environmental sustainability” in three key areas – energy efficiency, water efficiency, and waste diversion. Our recent PACE certifications are clear evidence that Management and Engineering Services continues to “walk the walk” toward environmental sustainability. These efforts, on behalf of our own company, help us recognize and resolve the sustainability challenges faced every day by our many clients. 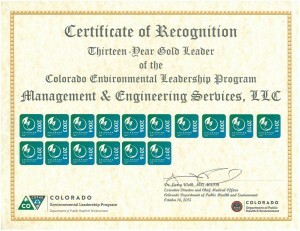 Management and Engineering Services (MES) is pleased to announce completion of its 15th consecutive year as a gold-level member of the Colorado Environmental Leadership Program. In order to maintain its “gold” standing over these many years, MES has had to demonstrate its continued commitment to clearly defined environmental goals, a fully implemented environmental management system, and a clean compliance record. But Management and Engineering Services’ commitment to environmental sustainability has always exceeded the requirements of the Environmental Leadership Program – even at the gold level. For example, in 2018 MES completed certification of its own in-house operations in five separate management areas; ISO 14001:2015 (Environmental), ISO 45001 (Safety), ISO 50001 (Energy), ISO 14046 (Water), and ISO 9001 (Quality). For decades now, MES has been actively spreading the gospel of sustainable environmental management practices for business. And, while many of our clients are located outside of Colorado, Management and Engineering Services has shared its sustainable-practices expertise with Colorado-based companies through the MES Mentoring Program. This program is dedicated to helping smaller companies implement standards-based management systems so that they, too, can realize the benefits of sustainable operations. Management and Engineering Services would like to thank the Colorado Environmental Leadership Program for its continued recognition of our company as a “gold standard” environmental leader in the Colorado community. Way back in 1951, a young seminary student by the name of Warren Ost spent the summer working in Yellowstone National Park. While he was there, Mr. Ost noticed that the faith-based needs of park workers and visitors were going unmet. In response, one Sunday Mr. Ost led an interdenominational worship service in the bar of the Old Faithful Inn. Thus, A Christian Ministry in the National Parks (ACMNP) was born. Since those early beginnings over 65 years ago, ACMNP has been providing Christian worship services within the awe-inspiring surroundings of the national parks. Every Sunday between Memorial Day and Labor Day, ministry team members offer approximately 150 worship services, at 75 sites across the country, in 25 different national parks. Over 1,400 Sunday services are offered each summer, with over 30,000 people attending! Management and Engineering Services (MES) has been a proud financial supporter of ACMNP for many years. Now, for the second year in a row, MES has donated the materials and labor needed to produce 400 copies of the ACMNP training manual. These manuals are used to train the hundreds of volunteers from over 100 college campuses and 30 seminaries, in 35 states, representing more than 30 Christian denominations. We here at MES salute the good people of ACMNP and wish them continued success in their important mission of bringing comfort and inspiration to park workers and visitors alike. Management and Engineering Services, LLC is very pleased to announce that Harry Garland has joined our Development Team as a senior software engineer. A polyglot (multi-language) programming expert, Mr. Garland will spearhead the development of specialty software applications for MES, focusing on contract management, RFID and barcode applications, training-event tracking, information exchange, and security. New to Colorado, Mr. Garland is a recent transplant from Silicon Valley, where he spent the last 20 years developing business and social applications for a variety of cutting-edge technology firms. In addition to his passion for programming, Mr. Garland is a successful part-time inventor who has been granted four patent certificates to date. Please join us in welcoming Harry Garland to the MES team! Management and Engineering Services, LLC has reached an agreement with Blue Star Recyclers to develop a web-based implementation of the e-Stewards Standard for Responsible Recycling and Reuse of Electronic Equipment. Based on the OHSAS 18000 and ISO 14001 frameworks, the e-Stewards Standard is a comprehensive set of performance requirements created specifically for the electronics recycling and asset recovery industries. In this new venture, MES will provide Blue Star Recyclers with the software tools they need to assist with the development, documentation and rollout of the organization’s environmental policies, operational controls, and performance metrics. Automated monitoring, alert, and reporting functionality will make successful completion of compliance evaluations and audits a snap. And, since ISO 14001 is fully integrated into the e-Stewards Standard, Blue Star will be able to achieve dual certification in both ISO 14001 and the e-Stewards Standard in a single audit process. Management and Engineering Services, LLC is exceedingly pleased to be partnering with Blue Star, a Colorado firm that hires workers with disabilities to process electronic equipment for recycling. During the month of October 2016 Mike Bloise of Management and Engineering Services will complete the implementation and internal conformance audits of four manufacturing plants in the United States for Johns Manville. This brings to total to 32 plants now being supported by MES using a special version of the “MS3” computer-based applications for environmental management systems based on the international standard ISO 14001. Upon completion of a week-long ISO 14001 Environmental Management Systems Lead Auditor course with QAI Global Institute, Melissa Brashers of MES earned the opportunity to become a provisional auditor. Based on successful completion, Melissa is joining our certified team of auditors and is deemed competent for environmental management systems, management systems auditing, and to serve on management systems audit teams. QAI is authorized under Exemplar Global Incorporated (formerly RABQSA), an international not-for-profit Australia organization with charitable status. Erin Walton is our new technical editor and writer. She is a Colorado native and is an established professional writer and editor. She is currently pursuing an MFA in Creative Writing from Pacific University, Oregon. Erin brings with her extensive experience in the writing world, collaborating with local organizations, companies, and individual clients to create content that is professional and engaging. She is currently writing a non-fiction book as well as a series of lyric, memoir essays. Erin’s comprehensive knowledge of the English language and the nuances of professional writing and editing will be instrumental to MES in producing deliverables that are professional, thorough, and reflective of our commitment to providing high quality services to our clients throughout the United States. Melissa Brashers plays an integral role at MES as the newest Project Coordinator and Conformance Auditor. Melissa has 5-plus years’ experience in the environmental field and is currently completing her Master of Science degree in Land Resources and Environmental Sciences. Prior to working for MES, Melissa served as the lead wildlife biologist with Robert A. Booher Consulting and has also supported multiple environmental agencies through her volunteer work with the United States Forest Service and various nonprofit organizations. Melissa’s diligent and thoughtful approach is evident in an array of MES projects, from conducting research to collaborating with clients. Most recently Melissa’s knowledge and skills have been instrumental in the successful development and implementation of our Management System Support Site (“MS3”) applications including the creation of technical training manuals and offering client support. In addition to coordinating multiple projects, Melissa works intimately with various national parks and performs conformance audits. In each of her roles, Melissa demonstrates commitment to providing the highest quality service to our clients. MES announces a significant upgrade (version 2.5) to its Management System Support Site (MS3) to be released effective January 1, 2016, with transfers beginning on December 25, 2015. Two dashboard tasks — Competence, Training and Awareness (Dashboard Task 8 ) and Communication (Dashboard Task 9) have been updated with new and easy-to-use navigation for the Environmental Management System dashboard and the Safety Management System dashboard. While the functionality of these dashboard tasks remains the same, the tasks’ range of operations has been expanded. Within the competence dashboard task, a new option has been included to “import” common training events through which users can scroll to select the ones that apply. For the communication dashboard task, the functionality remains the same but consistency is improved in terms and duplications have been removed. While some user information entered in the previous version (2.0) will not transfer automatically, the MS3 Technical Support Team will manually transfer information on behalf of all users. MS3 users were notified with an alert on December 24.Questions may be directed to the MS3 Technical Support Team at (303) 682-5992, or by email at support@mesllc.net. Lauren Kowalski, MES team member, was recently trained by the Red Cross in First Aid, CPR and the use of AED (Automated External Defibrillators). She carried this certification to the next level and earned her Instructor Certificate in First Aid/CPR/AED as well. In order to be of further assistance to Management and Engineering Services clients seeking to offer the current best level of interpretive service, primarily to visitors of protected natural and historic areas, Ms. Kowalski studied with the National Association for Interpretation (NAI) and achieved the level of Certified Interpretive Guide. To enhance this work with the NAI, she studied with the Eppley Institute for Parks and Public Lands (based at Indiana University) a range of courses including Foundations of Interpretation, Media Fundamentals, and Training & Coaching Interpreters. Through the National Restaurant Association, Ms Kowalski became certified as a ServSafe Food Handler to support her auditing preparation. Upon completion of a week-long ISO 14001 Environmental Management Systems Lead Auditor course with QAI Global Institute, Lauren Kowalski of MES earned the opportunity to become a provisional auditor, competent for environmental management systems, management systems auditing, and serving on management systems audit teams. Management and Engineering Services staff member Melissa DeCino furthered her emergency response and food-related safety skills by completing a series of courses in the fall of 2015. The Occupational Safety and Health Organization (OSHA), a division of the U.S. Department of Labor, developed the Hazardous Waste Operations and Emergency Response Standard (HAZWOPER) program. The extensive regulations within this program protect workers at worksites where hazardous conditions exist. When followed appropriately, the HAZWOPER regulations ensure workers’ safety and health on the job. For the 24-Hour HAZWOPER training course, Ms DeCino covered 19 modules, including the recognition of Hazardous Materials and reference sources, toxicology, physical and chemical properties of various materials and solutions, respiratory and chemical protective measures, site control and safety hazards. Her ServSafe food safety training was undertaken through the National Restaurant Association. Certifications were completed at both the Food Handler and Food Protection Manager levels and included food safety regulations, safe food preparation and storage, as well as Hazard Analysis and Critical Control Points (HACCP), among other topics. Melissa is a Lead Auditor and Project Coordinator at MES. Has in place a fully operational, facility-specific Environmental Management System with goals. Meets the beyond-compliance requirements for the Gold tier. Has no serious violations for three years, or criminal violations for five years. As Management and Engineering Services, LLC continues to work as consultant with clients of all kinds to help bring them along to achieve this level as well, MES continues to seek improvements in its best management practices to proudly maintain this level for years to come. News of this year’s other recognized organizations can be found at https://www.colorado.gov/pacific/cdphe/news/elp. Management and Engineering Services, LLC, has enhanced its client collaboration capabilities with the installation of an interactive “smart board.” This device will be used with PCs and Mac computers and uses touch detection for user input (e.g., scrolling and right mouse-click) in the same way as normal personal computer input devices. The MES team will collaborate with clients in real time and be able to interactively hand-write notes and meeting commentary on to documents or presentations shared visually with clients in remote locations. Management and Engineering Services is pleased to announce that Ms. Lauren Kowalski joined our team in May 2015. Ms. Kowalski was a Management and Engineering intern in summer 2014. In her studies at the University of Northern Colorado, she enjoyed coursework in sustainable business operations and infrastructure, particularly agriculture, hospitality, and logistics. One feature of her undergraduate studies was to research tangible business aspects to help clients operate more sustainably. She earned a B.A. in Environmental Sustainability Studies/Business in May 2015. MES staffer Melissa DeCino successfully completed an ISO Energy Management 5000:2011 Lead Auditor Certification. The training was conducted in March 2015 in Arvada, Colorado, with AQS Management Systems, Inc.
Ms. DeCino is a Project Coordinator at Management & Engineering Services and a key member of National Registrar Team, an MES partner, for support of clients subscribing to the Internet-based Management Systems Support Site (MS3) tools. As an office dedicated to living what we advise our many clients to strive for on location and within their proposals to benefit the greater good and sensitive use of natural resources, MES seeks to reduce its environmental footprint on a daily basis. In 2014, recycling efforts among our staff achieved a savings of .74 tons (1,481 pounds) of material from the local landfill. Through the year we promoted the use of recycled materials by purchasing .62 tons (1,823 pounds) of recycled content office supplies. A supporter of local wind renewable energy, Management and Engineering Services offset its electrical usage by purchasing the equivalent carbon sequestration of 50.9 acres of pine trees (an amount equal to removing 13.1 passenger vehicles from the road). MES Client Johns Manville, an international building supplies corporation based in Denver, Colorado, completed 15 environmental management system certifications in 2014 under ISO 14001. Each plant was certified upon its first attempt in a detailed process expedited with minimal errors using Management and Engineering Services’ web-based software applications offered to subscribing clients through the Management Systems Support Site (MS3). In 2015, Johns Manville plans to complete six additional U.S. plant EMS certifications as it works toward certifying all 42 U.S. and Canadian-based facilities. Mike Bloise, Technologies Manager and Lead Auditor, is a key player in Johns Manville’s successes. When your contract requires submission of a Carbon Management Plan to the National Park Service, Management and Engineering Services is ready to help you pull together all of the necessary data. We will produce a professional and timely submission of your required plan. After we guide you through each step for topical data collection, MES tailors your plan from the client’s specific concession contract requirements and through the guiding parameters of ISO 14064-1 (the International Standards Organization document regarding quantification and reporting of greenhouse gas emissions and removals). Any major concessioner on a large National Park Service park can feed us their relevant, collected data on Greenhouse Gas (GHG) sources and “sinks” within the boundaries of their contracted area. MES filters and calculates the information into tables presenting the data for trends in direct and indirect energy sources of GHG, including fuel combustion from heating and vehicle fleets, and estimated data from solid waste and landfilling, as well as deferred wastes through recycling efforts, when available. Data is presented as total and net metric tons of Carbon Dioxide (CO2) equivalent, and helpful background explanations are included. Please contact MES for any questions you may have about this service. Melissa DeCino was certified in December 2014 as Lead Auditor for Environmental Management Systems by Exemplar Global (formerly RAB/QSA International). Working at federal and privately owned facilities, she qualified after logging eight solo audits and one team member audit, as well as 10 off-site days is the field. She has since surpassed the required execution of 15 out of 35 audits in a leader position. Craig Erickson, Management and Engineering Services president, was an invited participant in the American Recreation Coalition Partners Outdoors 2014 event in Washington, D.C. June 9-11, 2014. As a panelist, he shared on “Structuring Effective Partnerships: Back to Basics,” to provide his experience and perspectives on building and facilitating public-private partnerships. High-ranking members of a variety of national organizations offered thought-provoking messages on the challenges and opportunities of sustainable recreation funding, increasing and inviting diversity among visitors and employees within our nation’s national parks and conservation areas, and building partnership successes through volunteerism and service opportunities, among others. Keynote addresses over the three-day event were provided by National Park Service Director Jonathan Jarvis, U.S. Representative Raul Grijalva, D-AZ (Ranking Member of the National Parks, Forests and Public Lands Subcommittee), and Rick Cables, Vice President of Vail Resorts, Inc.
Other speakers and moderators included Lewis Ledford, Executive Director of the National Association of State Park Directors; Derrick Crandall, President of the American Recreation Coalition; Destry Jarvis, President of the Outdoor Recreation and Park Services, LLC; Kevin Kilcullen, Branch Chief in Visitor Services for the National Wildlife Refuge System, U.S. Fish and Wildlife Service; Jody Olson, Director, Federal Relations of the National Fish and Wildlife Service; Mary Ellen Sprenkel, President and CEO of The Corps Network, Carlos Alcazar, founder of Culture ONE World, Joe Elton, Deputy Director of the Virginia Department of Conservation and Recreation, Angelou Ezeilo, founder of the Greening Youth Foundation, and Jim Hannon, Chief of Operations for the U.S. Army Corps of Engineers. An event planned and hosted by the American Recreation Coalition, Great Outdoors Week and Partners Outdoors, two previously independent events held at different times of the year, also recognized outstanding outdoor recreation achievements by individuals and programs and included a service component through which volunteers worked at one or more recreation sites in the National Capital area. In May 2013 Management and Engineering Services, namely Craig Erickson, was invited to participate in a National Park Service commercial services workgroup to look at simplified procedures for concession contracts that would apply to small concessioners. Through this participation, Mr. Erickson was able to share our experiences with small concessioners who for nearly a century have been a critical part of the “fabric” of national park visitors’ experiences. The activities of this workgroup has continued into 2014 as new information is evaluated through a series of surveys of this unique group of National Park Service concessioners. Management and Engineering Services is pleased to announce that Ms. Charlotte Jansson completed her ISO 14001 lead auditor training with the British Standards Institute (BSI) in May 2014. She is deemed competent for environmental management systems, management systems auditing, and serving on management systems audit teams. Management and Engineering Services is pleased to announce that Ms. Charlotte Jansson joined our company in April 2014. Ms. Jansson brings extensive experiences in quality management processes, software development, and environmental management systems. Formerly of Glacier Park, Inc., she has current experience with many of our Management System Support Site (MS3) applications and implementation challenges and will apply this expertise as we work our new and expanding client base. Ms. Jansson was also formerly with Fulcrum Analytics and worked as a systems engineer with IBM Corporation. We all welcome Ms. Jansson and look forward to her significant contributions to our team. 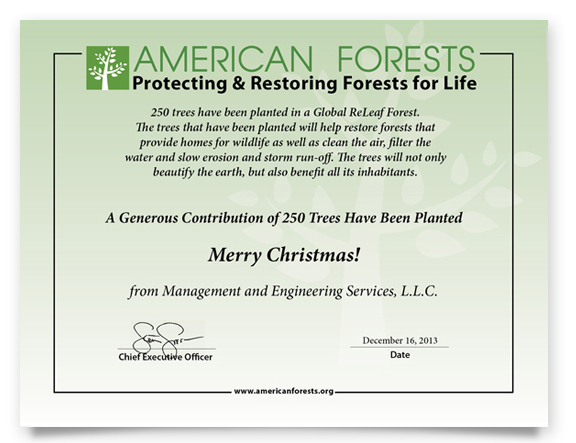 In partnership with American Forests, Management and Engineering Services in 2013 donated over 1,000 new trees to be planted at reforestation sites within the United States in recognition of our clients and to mark memorable events. We are happy to help this important organization carry out its mission to protect and restore forests to benefit the health of the planet. Restoring natural areas that have been devastated by human action or natural disasters helps to rebuild and protect watersheds, which contribute to the accessibility of clean drinking water. Restoration also creates critical new habitat for wild species. American Forests, the oldest U.S. nonprofit conservation organization, has established over 45 million new trees across the country since 1990. On April 17, 2014, Orion Registrar, Inc. recertified the environmental management system (based on ISO 14001) sustained by Management and Engineering Services since 2001. MES has maintained our environmental management system with annual registration audits for the past 13 years as an essential part of our progressive management commitments as well as to demonstrate our leadership experiences when working with other organizations considering similar commitments. On April 17, 2014, Orion Registrar, Inc. recertified the quality management system (based on ISO 9001) that has been sustained by Management and Engineering Services since 2003. MES has maintained our quality management system with annual registration audits for the past 11 years as an essential part of our commitment to quality in all that we do. Through our quality management system we have continually improved our work products to exceed our clients’ expectations. For the 2013 holidays, Management and Engineering Services chose to give an environmentally sustainable gift of 250 new trees to be planted to to thank all of clients. We at Management and Engineering Services, LLC believe that giving environmentally sustainable gifts is not only good practice but helps build a better world. Thank you, MES clients, for your continued support! Management & Engineering Services, LLC drives its consultancy services to expand each client’s efficiencies and expertise in managing its own safety, quality, and environmental systems. One such client, Blue Star Recycling (Colorado Springs, Colorado), received the 2013 24-Karat Gold Winner Award at the October 17, 2013 Colorado Environmental Leadership Program (ELP) in Denver. Management and Engineering Services mentored Blue Star Recycling in the implementation of an environmental management system (EMS), which led to Blue Star achieving e-Stewardship, R2, and ISO 14001 certification. MES was recognized as the fourth Gold Leader in the ELP program and returned for our 11th member year. MES exhibited at the program and spoke with other program members about helping them achieve Gold status. Other ELP members we guided in environmental achievements include: Johns Manville, Colorado Army National Guard, Rocky Mountain Park Inn, TrendZ at the Park, City of Aspen, Blue Star Recyclers, and Denver International Airport. The October awards program is hosted annually by the Environmental Leadership Program under the Colorado Department of Public Health and Environment. The statewide Environmental Leadership Program offers benefits and incentives to members that voluntarily go beyond compliance with state and federal regulations and are committed to continual environmental improvement.